Okay folks. 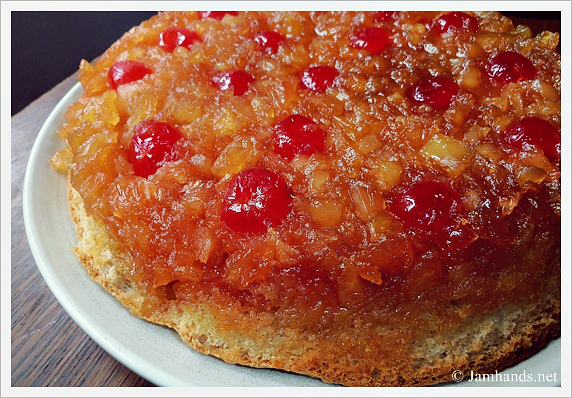 Today we are making a very sweet, very delicious Pineapple Upside-Down Cake. There are many a recipe for Upside-Down Cakes that call for cake mixes but we are gonna go with the from scratch route today. Having tried many alternate recipes over the years for this particular cake, I have to go with making it from scratch. It just tastes so good! If you have never tried it before, it is a delicious yellow cake that is saturated with a caramel sauce (thank you butter and brown sugar!) 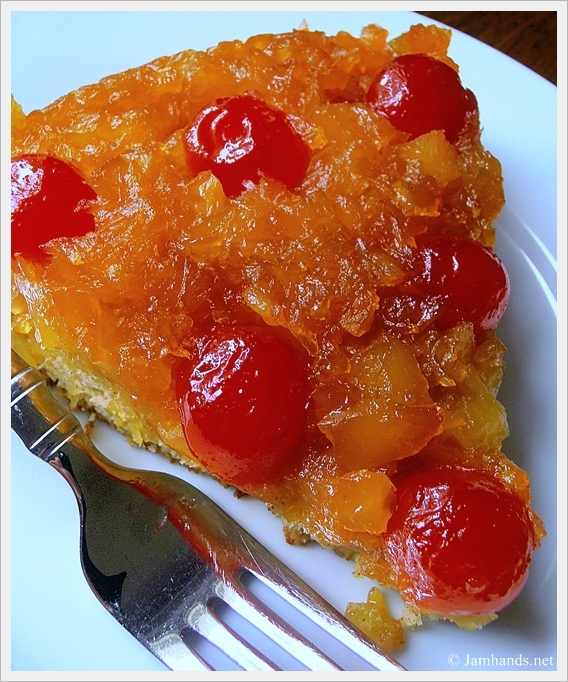 and studded with pineapple and cherry pieces. This particular recipe has a nice addition of pecan halves which add a bit of crunch and flavor to the cake. The one nit picky point about this recipe is that a cast-iron skillet is used instead of a cake pan. You can use whatever pan you'd like, but you will have to wing it when it comes to altering the temperature and cooking time. If you'd like, you can serve it with a bit of lightly sweetened whipped cream, or for the more indulgent folks, a scoop of vanilla ice cream. My changes: Was out of pecans so skipped them. Added 1/4 teaspoon of ground cloves. Used 1 large can crushed pineapple, drained, reserving the juice. 1. Melt butter in a 10-inch cast-iron skillet over low heat. Sprinkle brown sugar in skillet. Remove from heat. 2. Drain pineapple, reserving 1/4 cup juice. Set juice aside. Cut pineapple slices in half, reserving 1 whole slice. 3. Place whole pineapple slice in center of skillet. Arrange 10 pineapple pieces, spoke fashion, around whole slice in center of skillet. Place a pecan half and a cherry half between each piece of pineapple. Place a cherry half in center of whole pineapple slice. 4. Arrange remaining pineapple pieces, cut side up, around sides of skillet. Place a cherry half in center of each piece of pineapple around sides of skillet. 5. Beat 3 egg yolks at high speed with an electric mixer until thick and pale; gradually add 1 cup granulated sugar, beating well. 6. Combine flour and next 3 ingredients; stir well. Add to egg mixture alternately with reserved 1/4 cup pineapple juice. Stir in vanilla. 7. Beat egg whites and cream of tartar at high speed until stiff peaks form; fold beaten egg whites into batter. Pour batter over pineapple in skillet. 8. Bake at 350-f degrees for 45-50 minutes or until cake is set. Let cool 5 to 10 minutes. Invert cake onto a serving plate. Scrape any remaining glaze from skillet onto cake. Cut into wedges to serve. This sounds wonderful, I had to pin it! Wawaweewa, that looks amazing! I'm going to try this one for the state fair next year. Last year I got 2nd place. Hopefully this will get me 1st! Ali, yummmmm. This looks amazing! Will you make it for me. Haha!! Ah, lovely. I am attempting a lemon upside down cake today. Exciting times! All that wonderful goo on the top of that cake, oh my Ali! Your photo is so good I tried to pick up the fork. This is a great dessert for your Chicken Casserole! Hope you are having a great week end and thank you so much for sharing with Full Plate Thursday. Happy St. Patrick's Day and Come Back Soon!